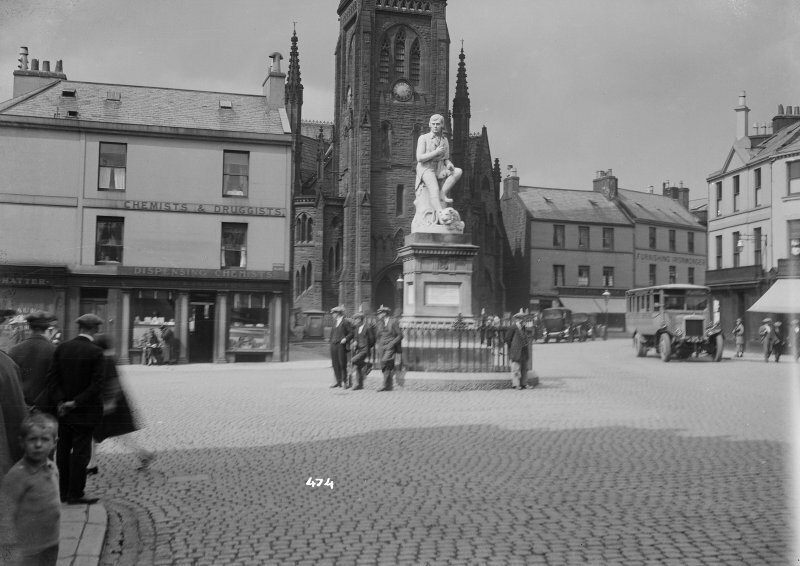 General view of the Burns Statue, Dumfries. The statue of Robert Burns stands in the centre of Dumfries and was commissioned by the town council of Dumfries in 1877. The model was created by sculptor Amelia Paton Hill and carved by Italian craftsmen in Carrara. It was unveiled in 1882. The figure of Robert Burns is portrayed in a seated position with a faithful dog at his feet. It was created in Carrara marble, with a sandstone plinth. The statue was cleaned, repaired and restored in 2005. This involved repairing decayed areas affected by pollution, removing biological growth, cleaning and repairing water traps, removing 'pollution crust', which was upto 15mm thick. In addition, a number of cracks were treated and repaired, along with previous poor-quality repair work. Weathered areas of the statue were repaired. Finally, the sandstone plinth was repaired, cleaned and restored.